Populations had started their decline in northern Minnesota in the 1980s when a new high school hockey juggernaut emerged from the Twin Cities’ southern sprawl. The nickname for the school’s athletic programs back then was the Braves, and their black and gold color scheme was heavy on the black. Burnsville’s players were big, strong, fast and physical. Talk about intimidating. This was a team that, despite its lack of pedigree, couldn't be dismissed. The upstart Braves reached the 1983 state championship game in their first state tournament appearance, losing 4-3 to Hill-Murray. The next year, with youth hockey scoring sensation Scott Bloom in the varsity lineup as a sophomore, the Braves lost 4-2 to Bloomington Kennedy in the quarterfinals and finished in sixth place. “That’s what you did growing up, you sat and watched the high school tournament,” Bloom said. “That was your only goal. Bloom’s scoring exploits at the youth level were legendary. He grew up in Eagan, which had a youth hockey association but no high school. Players coming out of middle school had to chose between playing for Rosemount or Burnsville. “The Eagan kids, there weren't a lot of them that came over (to neighboring Burnsville),” said Bloom, who as a kid converted his family's unfinished basement into a stick-and-puck shooting gallery. Routinely producing 100-goal seasons is a good way to gain acceptance. Bloom’s advanced hockey sense and wicked shot made him one of the most prolific youth hockey scorers the state has ever seen. Goals didn’t come as easily at the high school level. Not at the 1984 state tournament, anyway. Bloom managed just one assist in the Braves’ three games. Burnsville entered the 1985 state tournament with just one loss and expectations in the stratosphere. The Braves’ were loaded with so many upper-echelon players that their toughest competition often came during ultra-intense practice sessions. “Everybody thought they were better than the next guy,” Bloom said. “And you wanted to prove that point. 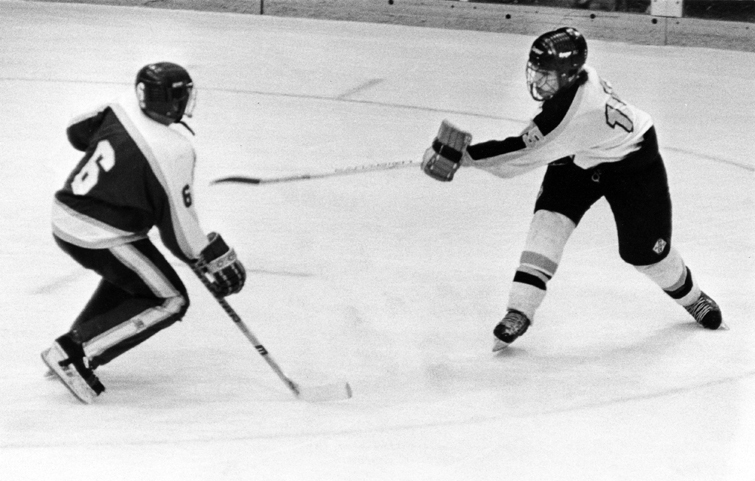 Bloom was held without a point in Burnsville’s 5-3 quarterfinal triumph over George Pelawa-led Bemidji in the 1985 state tourney. In a sign of things to come, Bloom scored the game-winner in the Braves’ 4-1 semifinal victory over Bloomington Jefferson. "When you needed something to happen, he would step up," said Kelly Ramswick, Bloom's neighbor in Eagan and teammate at Burnsville. "Somehow, some way it would be Scott that would pull us through. In the big games, in the big moments he would rise to the occasion." The 1985 state championship game belonged to Bloom, as he scored in the final minute of the first period to tie the score at 2, then scored one of the most dramatic goals in state tournament history in the closing seconds of the third. With the score tied at 3, Bloom unleashed a shot that beat Pioneers goaltender Rick Horvath with 27 seconds remaining. The Braves won 4-3. Despite undergoing a massive roster overhaul, Burnsville reached the state tournament again in 1986. Bloom and Osiecki were among the few holdovers from the previous season’s senior-dominated championship team. Burnsville entered the state tournament with a 17-5-1 record. Hill-Murray, with just two losses and most of its lineup back from the previous season, was heavily favored to win the championship. 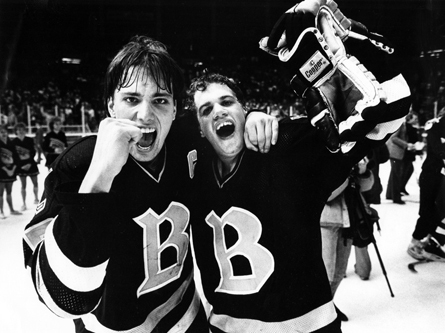 Bloom had three goals and two assists as Burnsville beat South St. Paul 7-4 in the quarterfinals of the 1986 state tournament. He added two assists in the Braves’ 3-1 semifinal triumph over Duluth Denfeld. Burnsville again squared off against Hill-Murray in the title game, and the Pioneers led 1-0 after the first period. Bloom scored what proved to be the winning goal in the second period and added another goal (and an assist) in the third in the 4-1 triumph. Bloom played four seasons at the University of Minnesota. After scoring a combined 18 goals in his first three seasons with the Gophers, he erupted for 24 goals in 43 games as a senior. Bloom, who never played professional hockey, lives in Prior Lake with his wife, Jody, daughter, Ella, 3, and son, Jake, 2. He works for Re/Max Advantage Plus and sells corporate apparel for Broder Brothers. Bloom also coaches Prior Lake’s Bantam A team.